The grass is still green and some leaves yet on the trees when the first lazy snowflakes come drifting down. It is early for snow, even here on the Canadian prairies; just a tease of what is to come, I think. Like white feathers shaken from the wings of angels, the flakes float earthward. I go outside, turn my face up to the sky and get lost in the swirl, entranced by each crystal kiss upon my cheek. 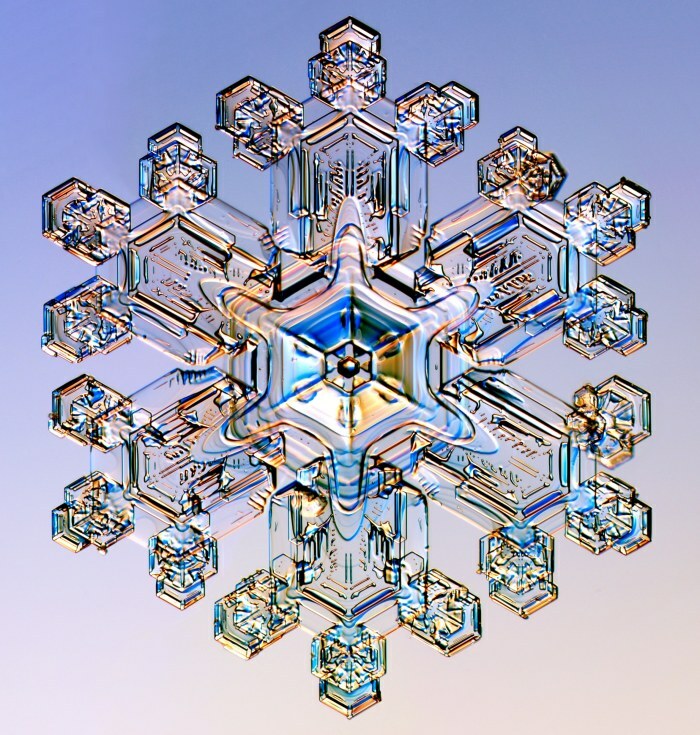 Remembering that every snowflake is unique in design, a combination of crystals only made once, intensifies the wonder. No amount of cold, hard scientific explanation can detract from the intricate beauty of a magnified snowflake. Technology has equipped scientists to photograph individual snowflakes with precise detail. They are microscopic works of art, beautiful symmetry too small to see with the naked eye. Author and naturalist, Henry David Thoreau, said of snowflakes, “How full of the creative genius is the air in which these are generated! I should hardly admire more if real stars fell and lodged on my coat. Nature is full of genius, full of the divinity, so that not a snowflake escapes its fashioning hand.” The “fashioning hand” he refers to belongs to God, the Creator. Even a man steeped in Indian spiritual thought recognizes that snowflakes could only be divinely designed. Such is the unlimited imagination of our Creator God. “He says to the snow ‘Fall on the earth,’ and to the rain shower, ‘Be a mighty downpour.’ so that everyone He has made may know His work. – (Job 37:6-7 NIV) The Creator shows Himself to His creatures through His creation. So the question arises, why does God make something unlikely to be seen in its minute beauty so ephemeral? Does it really matter that each snowflake is beautiful in its own form, no two alike, when it is destined to melt away? As with so many questions about God, I believe the answer is love. By placing His fingerprint on every single snowflake He is saying to us, “See how I love you! I want everything around you to be beautiful, to bless you and cause you to see Me and turn to Me.” A snowflake is only one wonder out of the myriad of His creations which speaks love in its beauty, intricacy and purpose. In one way a snowflake resembles God’s ultimate creation, man. Each single snowflake, like each human being, is original, genuine, one of a kind. “For You shaped me, inside and out. You knitted me together in my mother’s womb long before I took my first breath. I will offer You my grateful heart, for I am Your unique creation, filled with wonder and awe.” (Psalm 139:13-14 The Voice) Every one of the seven billion people on earth today is unique unto themselves, formed by the loving hands of their Creator to be an individual like no other. Does that not speak love? A snowflake cannot wonder about its maker, but I can. I wonder what He was thinking when He formed me in my mother’s womb? Did He stretch out my fingers to make them long and narrow? What shade of autumn leaf did He imagine when He chose the color of my hair? Did it give Him pleasure to plant joy with each word I would someday write? Having come from a temperate climate to a place where there are four distinct seasons, snow is still a novelty to me. I hope l never lose the wonder of a fresh snowfall. May each minute snowflake remind me of God’s limitless capacity to create distinctiveness in nature and people. The fact that we cannot fully comprehend the vast diversity displayed in the universe should be sufficient evidence of God’s existence for those who doubt.